For decades, the tiny village of Ravenmoor has existed quietly on the upper reaches of the Lampblack River, far from the centres of civilization in Varisia. Linked to the outside world only by an overgrown, mostly forgotten trail, the villagers are comfortable with their isolation. Their ways are humble, quaint, and at times odd, and when travellers come, they find the town awkward and unmemorable. Certainly, the lack of a village inn, the oppressive humidity, and the bug-infested moors and swamps that surround the village do little to encourage visitors. When a clerk in the city of Magnimar discovers that, due to a clerical error, the village of Ravenmoor hasn't paid taxes in years, a tax collector is sent to the distant community to settle accounts with its mayor. When the tax collector fails to return, however, a group of adventurers must travel to the town during its Founders' Feast celebration to investigate his disappearance. Did he really make off with the taxes for himself, as the villagers suspect? Or did he never make it out of Ravenmoor at all? 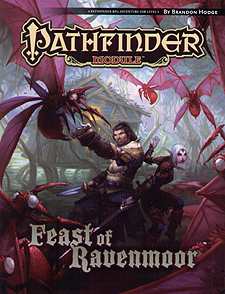 Feast of Ravenmoor is an adventure for 3rd-level characters, written for the Pathfinder Roleplaying Game and compatible with the 3.5 edition of the world's oldest RPG. It features a terrifying adventure set in a rural village in the frontier realm of Varisia, and a brand-new monster eager to torment and frighten unsuspecting adventurers.